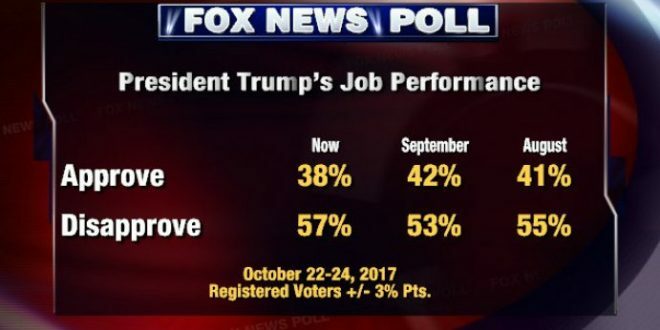 Trump Hits New Approval Low In Fox News Poll - Joe.My.God. President Donald Trump’s approval rating sank to a new low in a Fox News poll, with only 38% of respondents telling pollsters they approved of Trump’s job performance. The poll, released Wednesday, comes after a turbulent month marked by a series of destructive hurricanes, the resulting crisis in Puerto Rico, and Trump’s ongoing controversy with several Gold Star families. Trump’s 38% job-approval rating is down from 42% last month, while disapproval is up to a high of 57% from 53% in September. Despite the drop, Trump’s approval among Republicans is still strong at 83%. Only 7% of Democrats and 30% of independents approved of Trump’s performance.